Winter After Hours is HERE! Snow is gone and the bike trails are running. The flow trail and lower flow trails are running good. The westside trail is great but still continued to be worked on, please be aware of changing conditions. Just below the flow trail, we are installing a new downhill gravity trail. We currently work Tuesday evenings on this trail to get it complete. Stay tuned for more updates and hopefully a race in the fall. Click here for more information from Volume One. OutdoorMore, Inc has officially received our non-profit 501(c)3 status through the IRS. This has been almost 2 years in the works and a dedicated committee to make that happen. Huge thank you for our amazing, committed, and driven committee that backs this project. More project updates are coming soon...so much happening in the background for approvals, we look forward to updating everyone on what's happening. 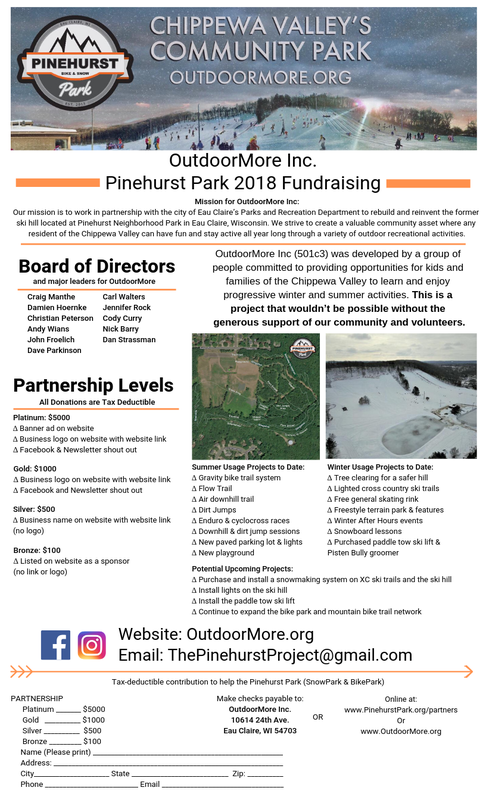 The committee for OutdoorMore Inc and Pinehurst Park is getting one step closer to giving Eau Claire another outlet for winter action sports. They are working closely with the City of Eau Claire to finalized the land and use agreement. Stay tuned for more information soon. Pinehurst Park received a unanimous thumbs-up from the Eau Claire Parks and Waterways Commission Wednesday February 25th for Phase Two. The OutdoorMore, Inc. group is still required to take the Phase Two ideas to the Eau Claire City Council for a final blessing but they are one step closer. Hill lighting, snow-making including a chiller pond, re-grading the tubing area with tube lanes, additional tree thinning along the top of the hill, (3) paddle and/or tow ropes, snow grooming, ski and snowboard rental, lift ticket concessions, ski and snowboard lessons, and snowshoeing/hiking trails.